Ok I feel like I should say that ThinkTank doesn't pay me or provide me free things, I just really love their gear. Their bags always have the features I need and nothing more, and they have a perfect bag solution to every problem I've had. This post is legitimately just me writing about a bag I love that changed shooting shows for me. Photo pits and shows can get pretty crazy, and having half your net worth on your back in the form of lenses and cameras doesn’t make it more comforting. I used different backpacks for years, but found it really annoying and time consuming to switch lenses while shooting, plus they are bulky. It was a little easier when I started using two camera bodies to shoot, having a telephoto on one camera and a wide angle on the other. But swinging around a backpack with other lenses, batteries, and accessories while having a body over each shoulder was awkward and the straps always got tangled up. Then I discovered sling bags. After trying out a few, I found my favorite; the ThinkTank Turnstyle 20. I promise I’m not a ThinkTank shill, but I love their products and this bag is honestly the best thing I’ve found for shooting shows. Remember to be respectful of other photographs and stash your bag under the barricade if the pit is small! I love this thing because this bag is perfectly sized to carry all the gear I need during the course of a show, and nothing more. It slings around super easily right to the front of my waist, so I can change lenses in 5 seconds then zip it back up and throw it on my back again. I’m always trying to sneak through crowds of people or around other photographers in the pit. For the first time since I started shooting shows, this thing makes me feel like I’m not going to hit people in the face with all the gear on my back. Even when I’m on tour and have all of my gear in a bigger bag in the green room, I will put my essentials in the Turnstyle and only go out to shoot the gig with that. Loaded up ThinkTank Turnstyle 20. Sorry for my terrible product photography. You can see how much extra space is in the 35mm f/1.4L slot. With all of that stuff, I still feel like I could fit even more in there. 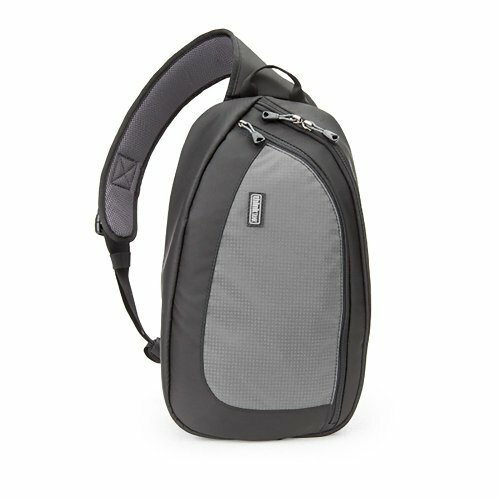 If you have a similar amount of gear you like to shoot shows with — 1-2 DSLR bodies, and 2-3 lenses — this sling bag is awesome. It's a tapered bag so on the largest end it can hold my 70-200 like a glove, which was a huge selling point for me. I can't believe I can fit a lens that big in a bag this minimal. Please feel free to compliment my graphics in the comments. It’s also my go-to bag for walk around shooting, especially on tour if I only want to bring a little gear. I’ll leave a lens at home and bring my film camera and mirrorless Fuji X100 and they both fit, along with extra film. It also has a pocket build for holding a tablet. I’ve used this in the past to bring my iPad out with me, grab some photos via wifi, and edit on my tablet while getting coffee or food quick. And if I don’t want to have my camera out and visible, the bag is fairly inconspicuous and it’s easy to throw it in there and forget about it. The strap is also a great feature of this bag. It has a clip buckle on the front so instead of swinging all your camera gear over your head you can just unbuckle the front to get it off. No built-in way to attach a lightweight tripod or monopod. Sometimes it’s nice to have one of those with you and you don’t want to carry it. Using a carabiner I was able to the straps, I was able to rig up my own tripod attachment pretty easily. It’s designed to sling over your left shoulder, so if for some reason that’s uncomfortable for you, I’d probably look for another option. The bag itself doesn’t provide a ton of padding for your gear. If it was heavily padded, I’m certain it would be heavier and bulkier, and I think it provides a happy medium for a lightweight bag. I would just refrain from dropping it or backing into things at high speeds.